Your commitments are piling up. You have no time to relax. Your commitments are piling up. You have no time to relax. A rejuvenating spa visit seems impossible. And expensive. Yet when stress is not controlled, it can weaken our immune system. This can lead to everything from weight gain and disrupted sleep patterns to heart and digestive problems. An hour for a relaxing bath and hydrating exfoliating session can help relieve stress. Create this serenity at home for only a few dollars with a trip to either the grocery or health food store. And this spa is personalized. Your body scrub should consist of an exfoliant, a binder and a moisturizer. First, choose an exfoliant. Not everything in the kitchen should be used on the skin, so be careful. It’ll need to be slightly gritty to gently abrade, not scratch, the skin. Exfoliating removes all the old dead skin cells from the epidermis, the outermost layer of the skin. Some ingredients naturally break down the protein that holds dead skin cells. This will eliminate the dull appearance of skin. I use at least half a cup, but there isn’t a specific amount. Second, pick a hydrator. These bind everything together to allow the exfoliant to be spread on the skin. It also makes skin silky. Sweating, wind and even drinking alcohol can deplete the second layer of skin, the dermis, of its natural supply of moisture, leaving it dry. Skin is roughly 70 percent water, so it’s important to keep hydrated. Measure at least a cup more than the exfoliant. Then add the third ingredient, a moisturizer. I use roughly a third of a cup of oil. Measurements don’t have to be exact so feel free to adjust as needed. 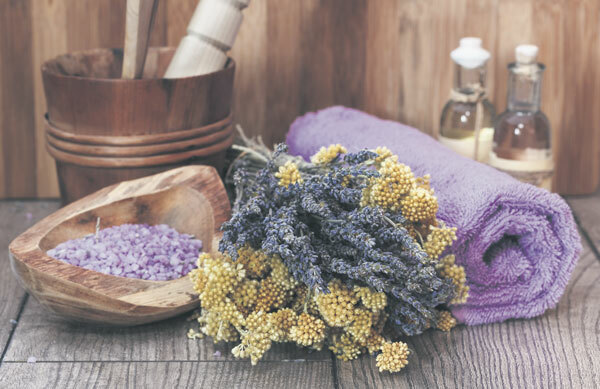 To add aromatherapy to the experience, include a fragrant essential oil. Some grocery stores carry them in the nature section in tiny bottles; health food stores have a larger selection. Because such oils are concentrated, a little will go a long way. These can calm or invigorate. For those who are pregnant, nursing, have food allergies or are on medication, please check with your doctor before using any ingredients on your body. Other do-it-yourself sites for skin care may not offer the best suggestions and should be taken with a grain of salt (pun intended). Stir everything together in a container that has an airtight lid. It should be thick enough to scoop out with your fingers without being runny. Test on a small spot, such as the inside of the wrist, for sensitivity. The mixture will keep refrigerated for a day or two if you want to make it in advance. Since our skin renews about every 30 days, it’s best to limit the body rub to only once or twice a month. Having children usually means my Fridays are spent at home. I try to find an evening after dinner when the family is doing their own thing. Sometimes my husband will put on a favorite kid-friendly movie and make popcorn so I can escape. If I’m able to plan ahead, I’ll steep a few chamomile or white tea bags, then pop in a few ice cubes to cool them off. They’re perfect for tired, puffy eyes. I set out a pumice stone or foot file. I also put a fluffy bath towel in the dryer for 10 minutes and fold it up to hold in the heat. Then I sneak into the bathroom with my favorite music, a few candles and a comfy robe. Once my hair is pinned up and I have a chilled glass of wine, I’m ready to unwind. Either rinse off in the shower or draw a warm bath (hot water is too drying) to moisten skin and open pores. Pamper delicate eyes with a chilled tea bag over each. When you’re ready, scoop out the body rub with your fingertips and gently massage it into your skin in a circular motion, avoiding the face and scratches or irritated areas. Take a moment to breathe in the calming fragrance and imagine releasing the stress you’re holding. Finish up your exfoliating with your feet. Then use the pumice stone or file on the heel, pad and bottom of toes to remove old scaly cells. Rinse the scrub off with cool water to close pores and seal in the moisture. Pat skin dry with the pre-warmed towel and use a favorite lotion, if desired. Snuggle into a robe. If I still haven’t been discovered, I’ll paint my nails just because I can. Taking some time for a spa treatment not only benefits you but those you care for. After this rejuvenation session I feel like I can take on the world. three types of ingredients, using one from each group.